Dark City: London is rated 4.3 out of 5 by 18. Rated 5 out of 5 by this_is_JI from Excellent! One of the best of 2017 Gameplay, story, puzzles, length & graphics all fantastic. Rated 5 out of 5 by skullfun from ~~A NEW GAME FROM 4FRIENDS YOU DON'T WANT TO MISS!~~ This new series by 4FRIENDS is another example of how popular this developer is quickly becoming. 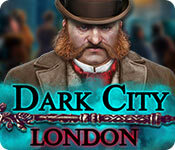 In Dark City: London you play the role of the detective. Called in to the solve the mystery of the cursed clock tower! The developers have done well to evoke the atmosphere of a classic grimy Victorian detective story. Reminiscent of Sherlock Holmes(without Dr. Watson) and Edgar Allan Poe. Especially with the depictions of the locations. The variety of characters – including the voice-acting (which I though was done very well)made this installment more interesting. The plot and game play are also nicely combined. Which quickly draws you into this unfolding dark and eerie mystery. The game play has plenty of variety. Though possibly a bit on the easy side. However there is plenty to do. Including multi-layered hidden object games. With mini-games and puzzles within HO games. Once you’ve collected the evidence at each stage. You’re presented with a deduction board. Where you can put your sleuthing skills to the test. By arranging the clues you’ve collected into the proper order to deduce important facts that will help you solve the case. Overall, this is a well-designed detective game. Though, it may not be very challenging for advanced players. There’s enough tasks involved to enjoy in the varied game play and the story is quite compelling. 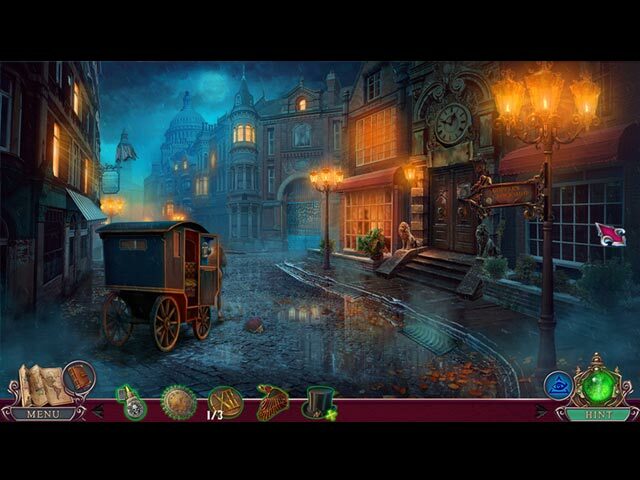 This HOPA has everything required to make it a fun Victorian mystery adventure. I really look forward to the next game in this exciting new series. Cheers! Check out these for more hidden object games series by 4 Friends Games: • Bridge to Another World Games. • Living Legends Series. • Edge of Reality Games. • Immortal Love Series. Rated 4 out of 5 by pennmom36 from YEP, BIG BEN HAS BEEN CURSED, IT SAYS SO RIGHT THERE ON THE SIDE, CURSED! I love this game, the more I played it, the better it got, which is a rare thing nowadays! I love the voice of the detective too, I think its by the same person who did the voice-over in the Enigmatis series. If you love Sherlock Holmes type mysteries, that take place in the Dark City itself, you're in for a treat with Dark City: London, I just hope they continue this series, that this isn't a one and done kind of game. Even though the game is a fairly easy game to play, it never seems repetitive and boring, unlike some games who include a bunch of meaningless tasks to stretch the game out to give it the appearance of being a long game. The only reason I gave this game just 4 stars, is ONLY because I prefer the Collector's Edition version, over this Standard Edition. My favorite feature is finding Morphing Object's, and in the CE version, not only are there collectible Dominoes to find, but there are also two Morphing Objects to find in every location (I'm doing my Happy Dance right now :) Here's a recap of my review, to help you decide which version, if either, is right for you: (you really should give this game a try) When Big Ben's cursed chimes play, London's sky will burn, the waters of the Thames river will rise and boil, the moon will eclipse to bring forth the Headless Clock-maker to herald the apocalypse of Death! The Headless Clock-maker will spare no one, his fury is fueled by revenge. His vengeance has an unquenchable thirst, a thirst for blood from those responsible for his families demise. But how can you stop a force as powerful as a dead man's sorrow? Welcome to London Detective, what a case! Not only are you tasked with finding the jealous culprit responsible for the clock-maker and his son's death, but also with solving a supernatural case of a curse as well! Is someone trying to sabotage the unveiling of the iconic Big Ben Clock Tower, or has the clock-maker indeed, risen from the grave to enact the unthinkable? You're a Detective, one of London's finest, so you won't be needing a puppet on a pillow, a scarecrow kid with glowing eyeballs, a mysterious device that checks the room for glowing orbs, or even a supernatural pair of glasses that let you see past events. Nope, you get to use a case file journal, and good ole' investigative reasoning's and deductions! Hmf, imagine that! You don't even have to trace an imaginary symbol without going outside of the line, to draw a conclusion, hmf, imagine that too! My only complaint is that I wish the categories didn't highlight automatically, to show you where each piece of evidence should be placed. I think it would have been more meaningful, if I had to figure out which category each piece of evidence went, using my own logic skills. (after all, I AM the best detective in London, right?) Oh, this game is looking better and better to me, 4 Friends has included Morphing Objects and collectible Dominoes in every scene, and sometimes more than one in the Collector's Edition version! There is a pull out tab on the left of the screen that tells you how many of each remain, AND they unlock special bonuses and games. Move over E, I've got a new best Friend 4ever, and they don't think it's too much work to offer Morphing Objects in every scene vs. only within a handful of HOP's, and collecting and playing dominoes is way cooler than finding the same old sign over and over in every single game. 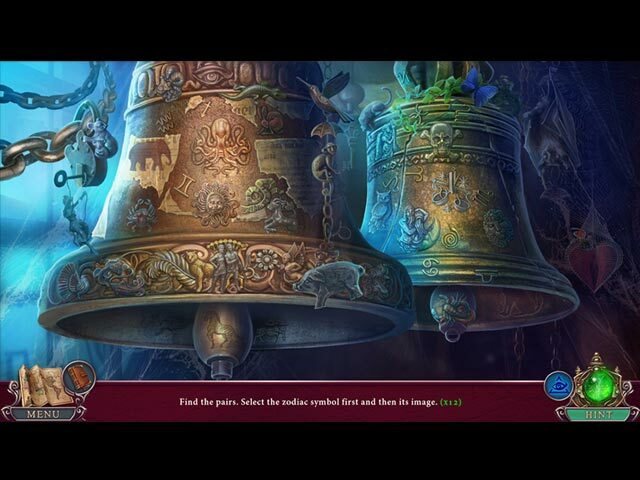 The Hidden Object Scenes are for the most part, multi-layered, creative and far less boring than most, although an alternative would be nice. There are Interactive List finds, Multiples of the same object or Multiples of similar objects such as food items or circus related items. There are several smaller Zoom Zone HOP's and some scenes have a small puzzle to solve. Each time you make a "deduction" you will find items within a black and white scene, to piece together the circumstances leading up to the current deduction as a chain of events. The Mini Games are well done with clear instructions to help you solve the puzzles. Below are brief descriptions of some of the games you'll encounter during the demo: 1) Find and rotate torn picture fragments to assemble the photo. 2) Move the latch to the round hole by choosing various numbers on the padlock, to move the latch that many moves as directed by the arrows. 3) Walk through the maze using the diagram to check your position and possible paths. 4) Drag a chain of 3 or more identical symbols to collect enough of each color to fill up your tubes. Avoid collecting your opponents colored symbols which will empty your tubes. The first to fill all 3 tubes, will take a punch, 3 punches win the fight. 5) Swap valves so each one matches the hole shape by following the twisted pipes. 6) Follow the twisted lines and rotate the outer ring to align the figures, and click to slide them into the outlined shape. 7) Arrange the pins according to the clue, note that the cards position is upside down. The Collector's Edition has 14 Concept Art pictures, 7 Wallpapers, 4 Screensavers, 4 Music Soundtracks, re-playable Movie Videos, 6 re-playable Mini Games, 20 re-playable Hidden Object Scenes, 28 collectible Dominoes (unlocks special bonuses) 31 Morphing Objects, 23 Achievements to earn, a built in Strategy Guide and a Bonus Chapter, enjoy! Rated 3 out of 5 by thebubba from Nice tour of London If you'd like to take a carriage ride around old London and enjoy some nice scenery courtesy of the developers above average art, then this game is for you. It's what hooked me but sad to say as the game progressed I was ready to hop out. Overly simple puzzles that sometimes solve themselves just by clicking, hidden objects that become repetitious, all the expected items you'll need (mucho keys, fishing pole, cork screw, animal food and on and on). Match 3 to fight an adversary and so on. And the ending was a real quicky. From the first 10 minutes I had higher expectations. Sadly they weren't met. But as I said earlier, a nice tour of London courtesy of some terrific graphics. Rated 3 out of 5 by effcee823 from Lots of dialogue. Good graphics I started on the demo and couldn't get past the first lot of dialogue. I came back and read the reviews so decided to keep plugging along. This is fairly simplistic game. Great graphics, LOTS of dialogue with a slow and repetitive storyline to the end of the demo. I don't think I'll bother to buy. Certainly can't see justification for previous rave reviews leaving me to question the validity of some. 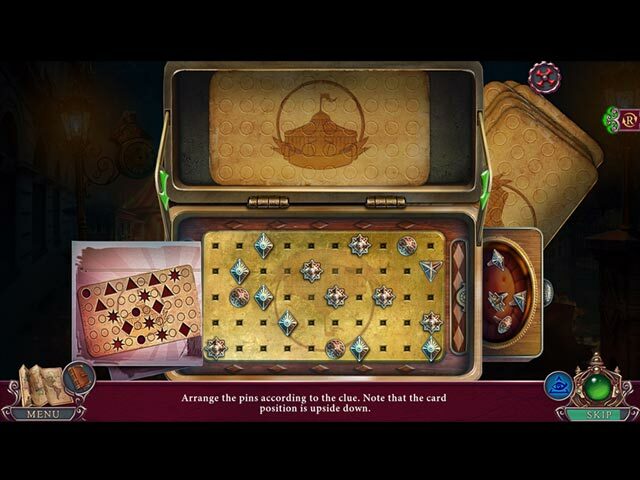 Methodical hidden objects, simple puzzles, not much challenge to it really. Rated 3 out of 5 by campingramps from Nothing to write home about This is one of those just ok games. Nice story line but it isn't coherent and tends to wander. The HOs are not much of a challenge and the mini games are rather easy. Played all but 5 minutes of the demo and I remain on the fence for this one. I don't recommend it for myself but others might like it so play the demo and decide for yourself. Rated 2 out of 5 by roaming from Not to my liking I didn't care for this game at all and quit before the demo was up. There are way too many puzzles... puzzles within HOS and HOS within puzzles. I also didn't like the deduction tool, which in effect is simply yet another puzzle. What with all of that going on, it felt like the game was moving forward way too slowly, and offered nothing to hold my interest. I will say the graphics were very good overall, however in some cases were grainy and blurred.